BOTOX and dentistry go hand-in-hand for many reasons. One of the main reasons to have a Dr. Anna Berik treat you for BOTOX is that as a dentist, she is a specialist of the face and mouth. Dr. Berik takes a full facial esthetics approach to dentistry and not just “fixing teeth.” During a smile design, the eyes, lips, nose and the rest of the face are all visualized in order to get a “big picture” view of the smile. She can evaluate you for any improvements that can be made to enhance your mouth and smile. Another great reason to have Dr. Berik do your BOTOX is the fact that dentists give more injections than any medical professional. Dentists are trained to give “painless” injections and this is no different for BOTOX. 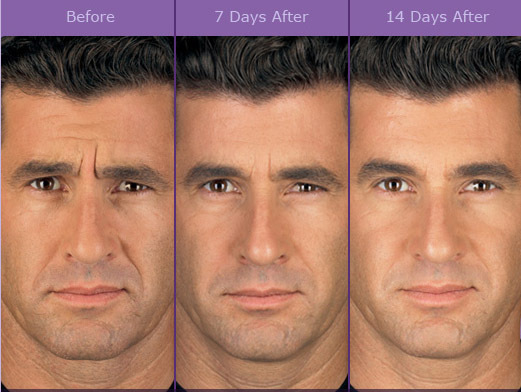 Millions have turned to BOTOX® Cosmetic to improve the look of their facial appearance. BOTOX® Cosmetic is an FDA-approved cosmetic treatment that can diminish visible signs of aging by reducing or eliminating moderate to severe lines and wrinkles on the forehead, and around the eyes. BOTOX® Cosmetic works by temporarily paralyzing the facial muscles that cause wrinkles, giving skin a smoother, younger looking appearance. The procedure is quick and painless. Patients can expect to see maximum results in about two days, although some results can be discerned immediately following the procedure. A BOTOX® treatment lasts about four months on average, and touch-ups can be scheduled to ensure that your youthful look is easily maintained. 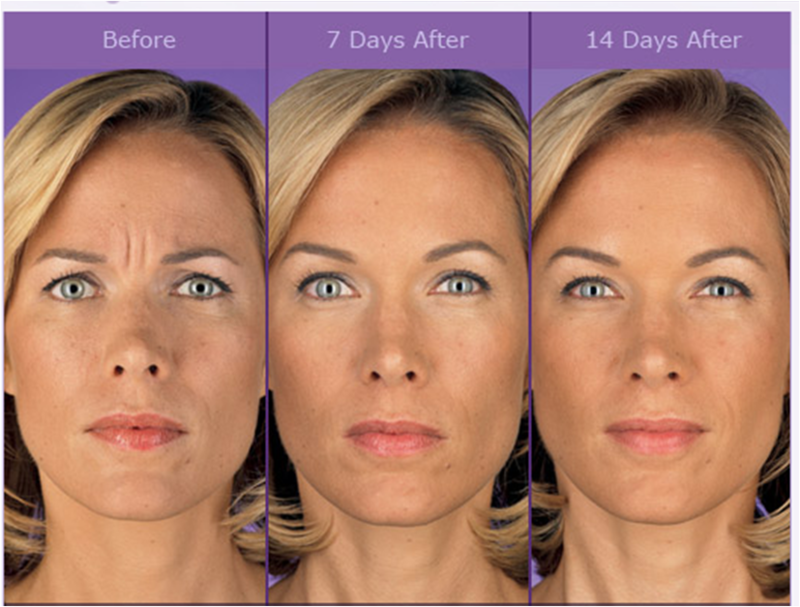 BOTOX treatment is a very easy procedure for the patient. Dr. Berik will evaluate you to see if you are a candidate for BOTOX. She will take “before” photos and then will mark the area of your face with a make-up pencil. 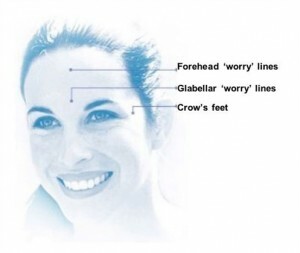 Dr. Berik will explain why it is recommended to treat these areas. At this point she will inject the BOTOX into the skin. The total treatment time is only minutes! The patient will then wait up to 2 weeks to wait for the full effect to come on. At that point, the patient will be scheduled for a visit to see if any enhancements are needed to complete the patient’s desires. 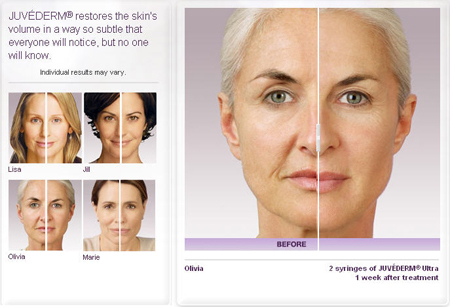 Juvéderm™ is a gel filler that is safe and long lasting. Dr. Anna Berik uses Juvéderm™ to augment lips. By injecting Juvéderm™ into the lips she can make them full and supple, which enhances the overall beauty of the face. Approved by the FDA in 2006, Juvéderm™ can be used for wrinkle correction on the face, to treat deep folds and smile lines, to contour the cheek and chin regions of the face, as well as add volume and fullness to lips. Results can be seen immediately, and they last an average of six months. When the results begin to dissipate, patients can schedule another appointment for treatment with Juvéderm™. The dermal filler gel is placed into folds and wrinkles that can be smoothed out to create a more youthful and fuller appearance. As we age, we loose collagen and fullness in the lips and facial tissue. 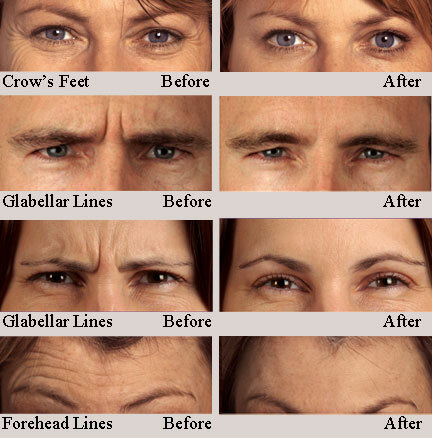 Dermal fillers are a great way to replace this lack of tissue to regain the normal youthful appearance you once had. Dr. Berik will evaluate you to see if you are candidate for fillers and then photos will be taken and your face will be slightly marked with a make-up pencil. The dermal fillers will be placed until the desired effect is achieved. The dermal fillers are usually placed with a topical gel that numbs the tissue as it is injected making it comfortable for the patient during the procedure. Because she is a cosmetic dentist, Dr. Berik can ensure patient comfort by completely numbing the area, this is not customary with the dermatologist or other providers. Depending upon the desired degree of correction, the procedure can last from 15 minutes to 45 minutes. Many dental patients will have their lips enhanced after having teeth whitening, Invisalign or crowns & veneers taking their treatment to the next level. Patients can resume normal activities immediately following the treatment with new, more youthful and vibrant skin. highly sought out and skilled doctor who is caring and passionate about her work and patients. Dr. Berik is a member of the American Academy of Facial Esthetics and American Academy of Cosmetic Dentistry. If you want to see how Dr. Berik can help you look younger and improve your smile, call 617-965-0060 and schedule a consultation.